Exchange of Fire and then blaming each other for violating cease fire agreement has became common now between Pakistan and India. 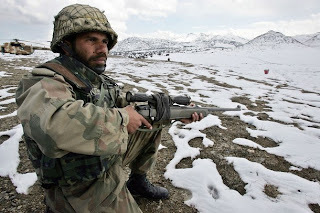 On Thursday Exchange of fire taken place between Pakistani and India forces on International border of in the Himalayan area of Kashmir. On Wednesday as well Fire exchanging taken place in Samba area of Kashmir. After Exchange of Fire Media of both countries blamed each other for violating cease fire agreement first. However no damage or loss of life is reported in this fire Exchange. In last 4 years more than 160 times Exchange of Fire on International border between forces of both sides has taken place.